The Sun Valley Fliers is chartered club #921 by the Academy of Model Aeronautics (AMA), the national governing body for aeronautical modeling in the United States. The club is an affiliate of the Central Arizona Modelers Advisory Council (CAMAC), and is recognized by AMA as a Gold Leader Club. 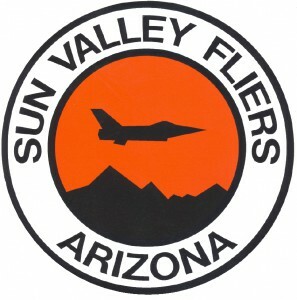 The Sun Valley Fliers organization was formed to secure, develop and operate a flying site for radio controlled model aircraft; to create interest in model building; to aid beginners through the exchange of knowledge, ideas, and experience; to promote model flying to the individual and the community; to provide a progressive training program for all phases of radio control model flying; and to promote recognition of appropriate activities. The flying site is located in North Phoenix about ½ mile WSW of the intersection of Cave Creek and Jomax roads, within the Cave Buttes Recreational Area that is owned by the Flood Control District of Maricopa County and managed by the City of Phoenix Parks and Recreation Department. This is on Cave Creek Road 4 miles north of Loop 101 and 5 miles south of Carefree Highway. It features a 600-foot long by 60-foot wide asphalt paved runway, shade ramadas, kitchen area, transmitter impound, a separate helicopter flying pad, and a portable toilet facility. The club has a formal agreement with the City of Phoenix to operate and control the flying site, and use of the facility is limited to club members, event competitors, and invited guests. Non-flying spectators are welcome, however they must pre-arrange to have a club member open the County’s locked entry gate on Jomax road, except during organized events when the entry gate will be unlocked and manned by representatives of the club. All pilots are required to possess and display a current Academy of Model Aeronautics membership card, which is proof of liability insurance, and are further required to fully comply with the AMA safety code and the Sun Valley Fliers field safety and operations rules. The Sun Valley Fliers club has designated instructor pilots who voluntarily provide flight instruction to beginner student pilots at no charge. Student pilots are required to belong to the Academy of Model Aeronautics, are required to have their own trainer-type model aircraft, engine, radio system, and field equipment and are highly encouraged to have a compatible “buddy box” along with their radio system to make their flight learning experience quicker, more enjoyable, and less costly. Student pilots are not allowed to fly their models without flight instructor assistance until after their instructor pilot has certified them as being capable of safely flying solo. Club meetings are held on the first Wednesday of each month at Deer Valley Airport at 7:00pm. Board meetings are held at 7:00pm on the second Monday of each month in the meeting room at the restaurant at Deer Valley Airport. It’s directly north of the intersection of Deer Valley Road and 7th Avenue.